What Are The Rest of the Kids Doing? 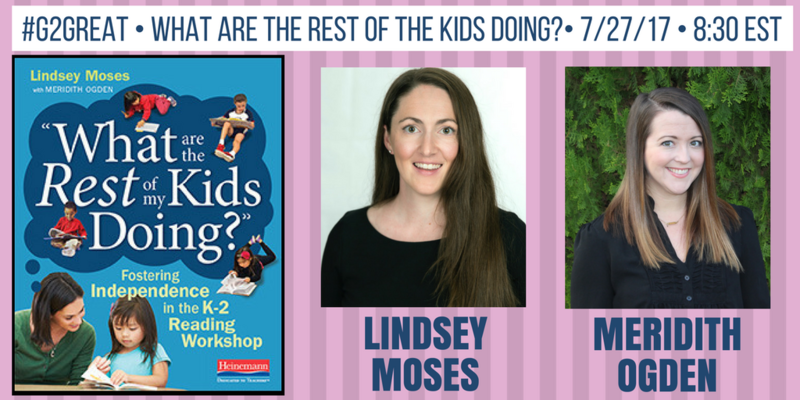 On July 27, 2017 #G2Great welcomes guest hosts Lindsey Moses and Meredith Ogden to talk about their book, “What are the Rest of my Kids Doing? Fostering Independence in the K-2 Reading Workshop. The title of their book is a question that is often raised when we start thinking about reading workshop and how we manage what happens after the minilesson and before the share. This is where the magic happens, because when students read independently they are growing as readers. Student independence is a critical piece of a successful reading workshop that must be supported by meaningful work that students are doing independently. 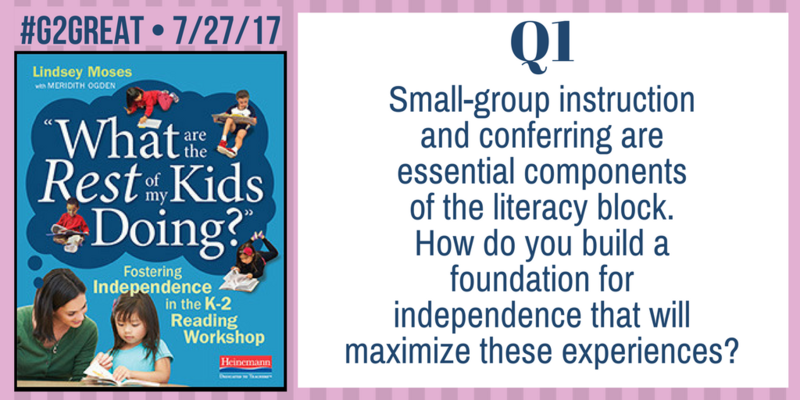 Small group instruction and conferring are essential components of reading workshop, with that in mind we have to ensure that students are engaged in independent work that is meaningful and supportive of literacy learning. 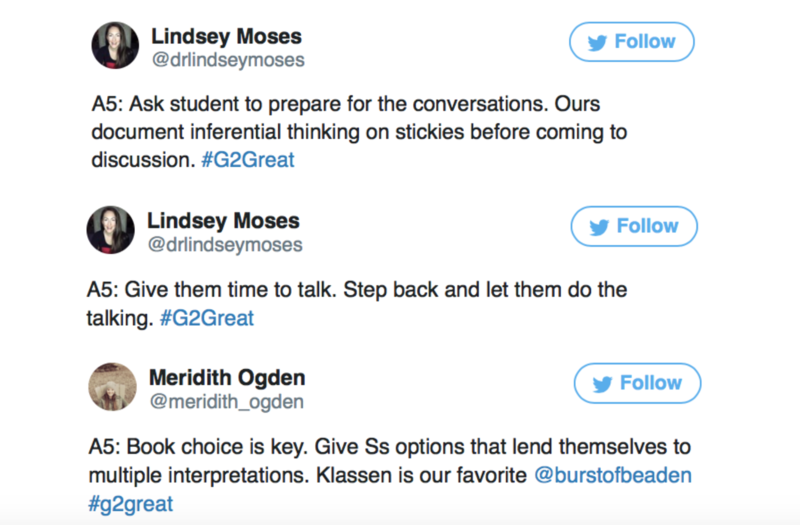 In their book, Lindsey and Meredith shared the importance of not only establishing routines, structures, strategies and learning opportunities but also revisiting these in order to extend or deepen the experiences. 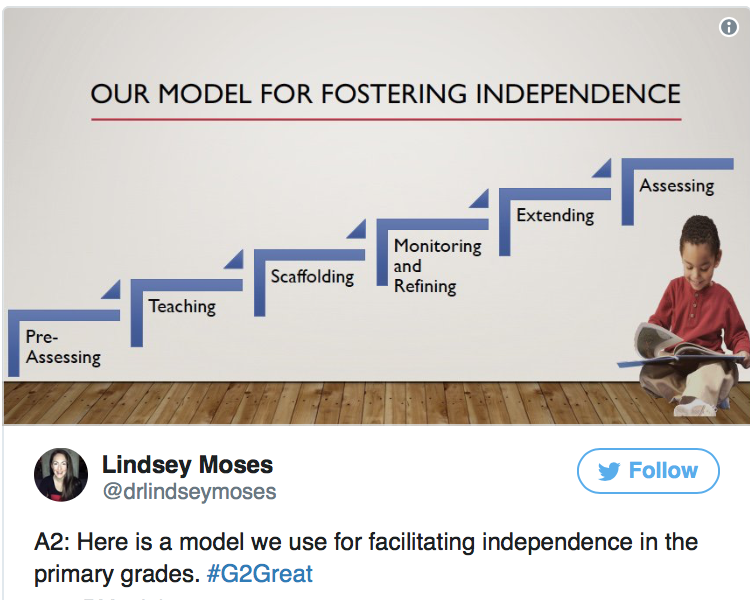 In reading workshop, Lindsey and Meredith suggest working from a goal of “independence” from the first day and then continuing to build independence while revisiting structures and strategies to extend or deepen children’s experience with independent work. In planning for meaningful independence during reading workshop Lindsey suggests that teachers look at and review every center, routine, worksheet if any and ask, “ What purpose does this serve in my students’ literacy development?” The answer to this question will help to shed light on how well the independent reading time is utilized. 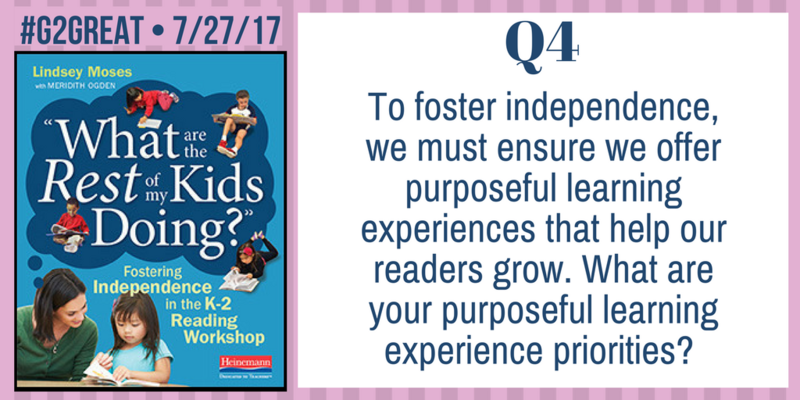 Purposeful Learning Experiences is the term that Lindsey and Meredith use to identify experiences that support literacy development and have real purpose for supporting independence. The chart below shows examples of different experiences from real classrooms and identifies what is a Purposeful Learning Experience and what is not a Purposeful Learning Experience. During reading workshop it is critical that we ensure the experiences that students have during the independent work time is meaningful. Students must be engaged in reading, this is the time where they are practicing the skills and strategies they have learned or are still learning. If we were to fill this precious time with mindless worksheets or activities that do not have a positive impact on literacy learning we are just wasting time. These experiences fail to cognitively engage our students in the important work of reading and thinking. On the surface, it may appear that students are engaged in the classroom at the moment however when students are not engaged cognitively they will not sustain this engagement over the long run. 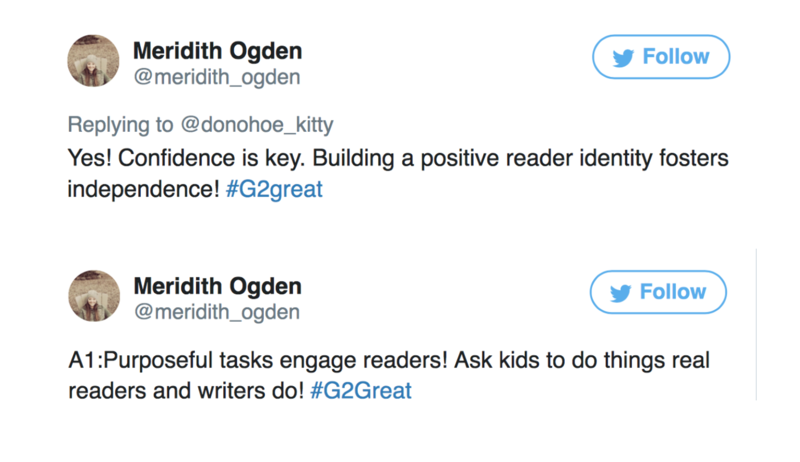 We have to look honestly at everything we are asking students to do and ask ourselves the question that Lindsey poses, “ What purpose does this serve in my students’ literacy development?” The answers should help us to ensure that students are engaged in Purposeful Learning Experiences during independent reading time. 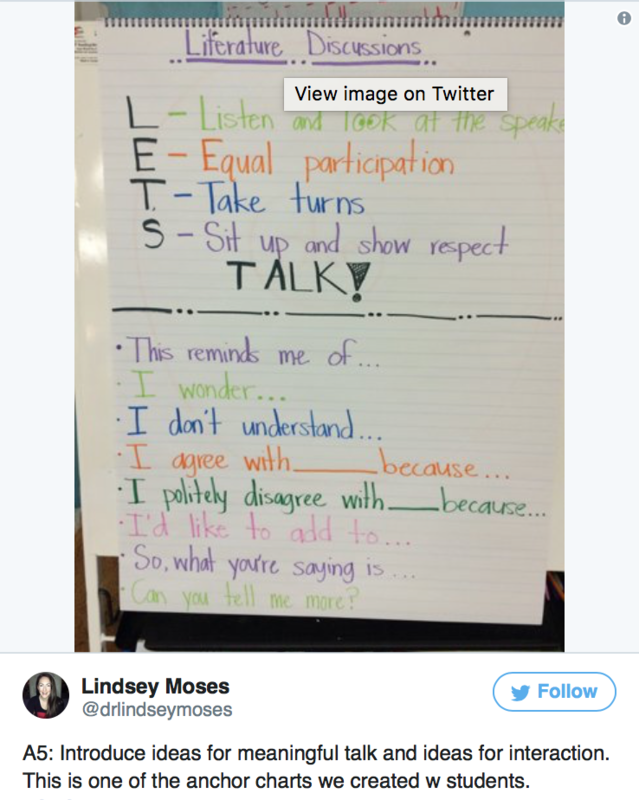 If you would like to learn and read more from Lindsey and Meredith check out the links below!